(Last Updated : 03.01.2019). HTET Admit Card 2018 Exam Dates : Download HTET 2018 Admit Card 05-06 January 2019 Exam Schedule - Haryana Teacher Eligibility Test (HTET) 2018 is scheduled to be held in January, 2019. Board of School Education Haryana, Bhiwani will conduct HTET Exam on 05 & 06 January 2019 for Level-1 (JBT), Level-2 (TGT) & Level-3 (PGT). Online Application for Haryana TET 2018 has been completed. Candidates who have applied online for HTET January 2019 can check here detailed schedule of exam dates, time table and admit card. HTET 2018 Admit Card for JAN 2019 Exam are available now to download through official website i.e. www.htet.nic.in & www.htetonline.com or hbse.ac.in. Download here HTET Admit Card 2018 and check HTET 2018 Exam Schedule January 2019. Here you can check detailed information about HTET 2018 Exam Dates and Admit Card. It is notable that HTET 2018 will be held on 05 and 06 January, 2019 for all levels. Here is detailed exam schedule and admit card download date. HTET 2018 Admit for PGT, TGT & JBT Exam January 2019 are available here to download as the admit cards are uploaded on the official website of HTET 2018. HTET Admit Card 2018 are issued only to those candidates who have successfully applied for the exam and paid their application fee. Download HTET Admit Card for HTET Exam JAN 2019. Note : There will some incorrect particulars (as photo, sign, thumb impression and mother name mission) in HTET Application Forms. The list of these candidates will be uploaded on the official website. Admit card of these candidates has been issued only after these corrections are updated. Download these lists and check your name in the list. Update your details, if there is any incorrect detail. Visit official website of HTET 2018. Click 'Download Admit Card for HTET (2018-19). Fill up all required details as Registration no., D.O.B. etc..
Take print-out of Admit Card. Go through the particulars printed on the admit card. Contact Special Exam Branch of HBSE, if found any discrepancy in the particulars of the candidate or his/her photograph or signature. HTET - Haryana TET 2018 Examination Schedule has been released by the BSEH (HBSE). HTET 2018 will be conducted on 05 & 06 January, 2019 for Level-1, Level-2 & Level-3. Detailed exam schedule and time table is given here. Candidates can download their hall ticket or admit card for HTET Examination 2018 to be held on 05 & 06 January, 2019 through official website of HTET-2018. Have you forgot your Registration No. and Password ? 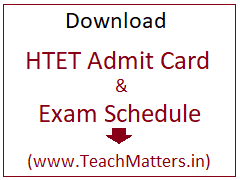 How to Download HTET Admit Card without Registration No & Password ? Click the link 'Login.' cited at the right side of the screen. Click 'Forgot Registration No. & Password'. Fill up all the details like Aadhar No. Name of Applicant as in Aadhar & DOB. Submit the details (click Search) and take print-out of Admit Card.